Prison should be reserved for those offenders who pose a risk to the public. Controversial it may be, but that is the only way that imprisonment can have a purpose and role in preventing re-offending. 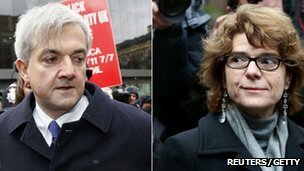 Huhne and Pryce were both convicted of perverting the course of justice, a serious offence carrying a custodial sentence of up to life imprisonment. But should such an offence carry a custodial sentence? Personally, I would be happier to see Huhne and Pryce sentenced to a community order, repaying their substantial debt to the public by cleaning our streets or working in charity shops. But the fact is, that was never going to happen. Guideline cases suggested a custodial sentence of between 4 and 12 months would be suitable, and so Mr Justice Sweeney cannot be criticised in passing a sentence of eight months in respect of both of them. But the reality is that they are likely to serve somewhere between 2 and 4 months, and be released on licence to serve the remainder in the community. Two to four months in prison is undoubtedly going to be a shock to the system for the likes of Pryce and Huhne, neither of whom have been imprisoned before, but what good will it actually do? It might give a feeling of satisfaction to the general public to see them shipped off to HMP Holloway and HMP Wandsworth, but have we considered who will be footing the bill of their stay? For that would be us, the tax paying public. It’ll cost us around £25,000 to feed and house the pair for them for 4 months, added to that is the cost of of the pair being on licence, post-custody, which the National Offender Management Service averages out at approximately £2,380 each. Had they been sentenced to a community-based penalty, not only would they be providing a public service but the tax payer wouldn’t be footing the bill for their food and accommodation. The costs of their supervision are estimated to be around £5,240 per offender. Considerably less than the costs of incarceration. What I advocate is a total change in sentencing powers and practice. Prison should be reserved for violent offenders who pose a real threat to the public. Our prisons should not be open to those who steal from shops, are addicted to cannabis or pervert the course of justice. Individuals who have committed non-violent offences should be diverted away from incarceration and serve their sentences in the community. Not only will this reduce the strain on our vastly overcrowded prisons and be cost-effective, but it will ultimately reduce re-offending as those serving custodial sentences will be subjected to intensive rehabilitation, the likes of which we simply cannot afford at present. This is not a new idea, the Howard League for Penal Reform have long argued that a cut in prison sentences and an increase in community-based penalties will have a dramatic effect in lowering re-offending rates. The fact is this isn’t going to happen overnight, but the increase in suspended sentences (now available for sentences of 24 months or less, an increase of 12 months since 2012) is a step in the right direction. But we need to take more of those steps. For things to change we need to see a total reform of criminal sentencing. Only then will we see re-offending rates substantially reduce, which is, arguably, the most important aim of criminal sentencing. This entry was posted in Comment and tagged Chris Huhne, Community Orders, Howard League for Penal Reform, Probation, Re-offending, Sentencing, Vicky Pryce on 12/03/2013 by Sara Williams. Youths The Youth Community Order was replaced in 2009 by the Youth Rehabilitation Order. A Community Order is a non-custodial sentence available to over 18s. The orders typically include a number of requirements with which the offender must comply. The requirements can be punitive, e.g. Unpaid work (what many people know as ‘Community Service’), preventive, e.g. an exclusion requirement (requiring the offender to stay out of a pre-defined area) or rehabilitative, e.g. a course aimed at curbing and treating a drug addiction. Multiple offences Where the defendant falls to be sentenced for multiple offences, careful consideration needs to be given to what eventual sentence will be imposed. Guidance should be sought from the Totality Guideline 2012, recently issued by the Sentencing Council. Persistent petty offending, some public order offences, some thefts from shops etc. Where the defendant’s previous convictions mean a discharge or a fine are inappropriate. Suitable requirements might be: 40-80 hours of unpaid work, curfew requirement within the lowest range, exclusion requirement lasting a few months, prohibited activity or attendance centre requirements. Handling stolen goods worth less than £1,000, some burglaries in commercial premises, some obtaining property by deception, some TWOC (taking a vehicle without consent) cases. Suitable requirements might be: 80-150 hours unpaid work, activity requirement in the middle range (20-30 days), curfew requirement up to 12 hours for 2-3 days, exclusion requirement around 5 months, prohibited activity requirement. For offences which only just fall short of the custody threshold, or where the threshold is crossed by a community sentence is more appropriate. An example might be a standard domestic burglary by a first-time offender. Suitable requirements might be: 150-300 hours of unpaid work, a 60-day activity requirement, a 12-month exclusion order, a curfew requirement of 12 hours per day for 4-6 months. Imposing requirements Requirements are imposed on a case by case basis; that is, the judge (Crown Court), or the district judge or magistrates (Magistrates’ Court) will assess what is the most appropriate way in which to deal with the offender. Examples A shop-lifter who steals to fund his drug habit may be suitable for a combination of supervision, drug treatment and unpaid work. The unpaid work will act as a punishment and attempt to establish some routine and consistency in the offender’s life, the drug treatment will address the motivation for offending, and the supervision acts as a method of monitoring the offender’s progress. A man who has pleaded to cultivation of cannabis may be suitable for punishment and supervision. He may receive 240 hours unpaid work and supervision. With the absence of a drug-addiction (the motivation for the offending being financial), drug treatment would be unnecessary. Period on remand not the determinative factor R v Rakib 2011 EWCA Crim 870 held that where the defendant had spent a significant period on remand, but the court considers a community order to be the appropriate sentence, the period spent on remand is not and cannot be a necessarily determinative factor in deciding what the correct sentence is (as R v Hemmings suggests). It may be that the period served on remand is such that the court considers no further punishment is necessary. Where the defendant has served a period on remand equivalent to the maximum sentence, there is still a discretion to impose a community order, even if that includes substantial restrictions on liberty. This entry was posted in The Law, Explained and tagged Adults, Community Orders, Crime, Non-custodial sentences, Sentences on 09/10/2012 by UK Crime Blog Admin Team.